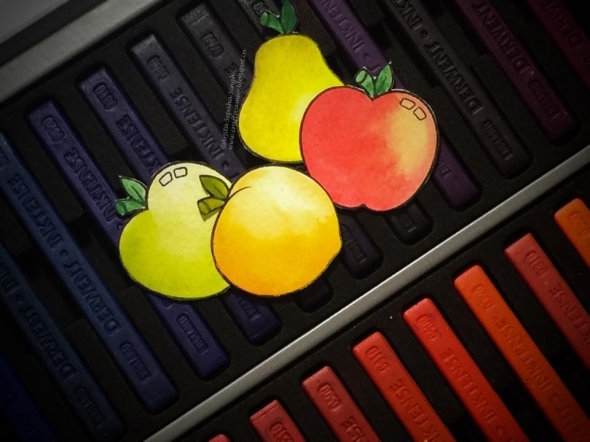 Today's blog features the Wallpaper art stamp set by Altenew. I love painting flowers and specially flowers with bigger petals. 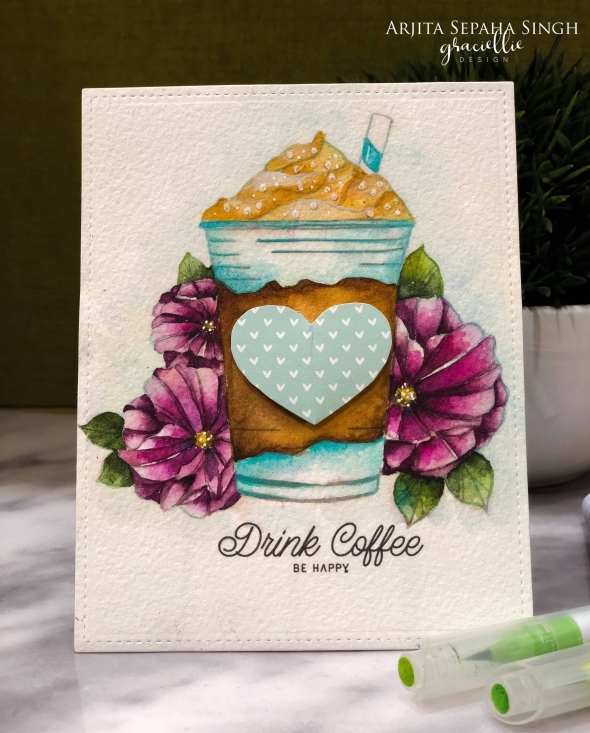 This is a perfect set to try watercoloring and I had a great time painting it.I used Distress inks for this card today and its a loose style watercolor painting. 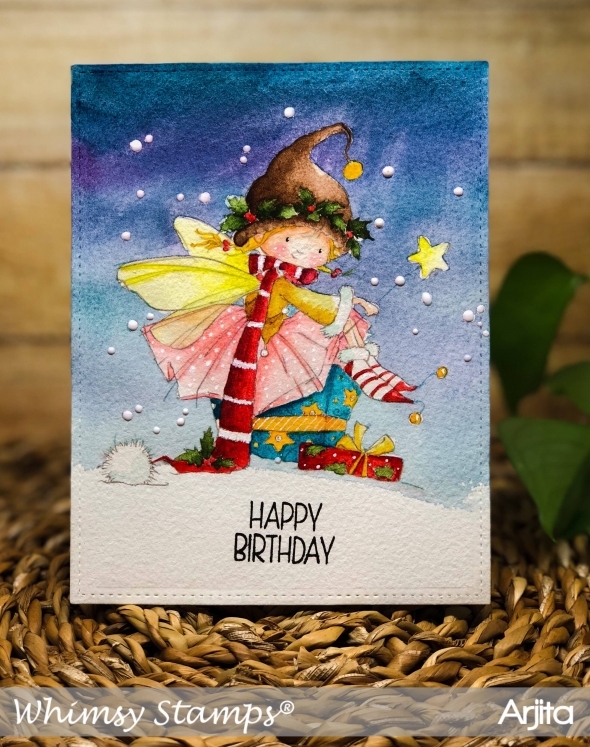 For today's card I have used the CHRISTMAS SPRITE stamp set by Whimsy Stamps which was released in October 2018. 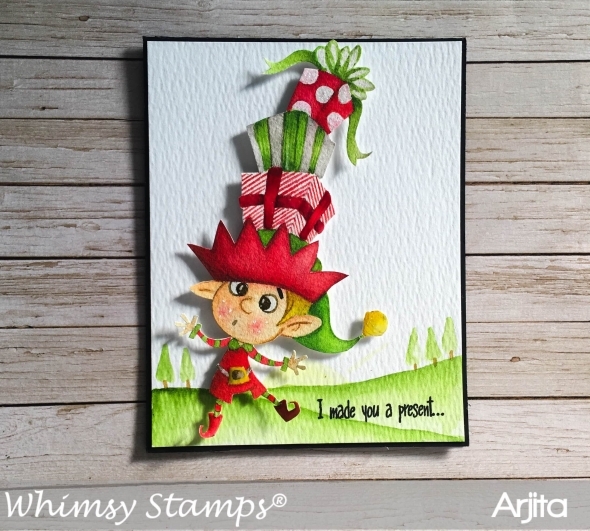 I love colouring these beautiful fairies by Whimsy Stamps which are perfect for the coming Holiday/Christmas season. 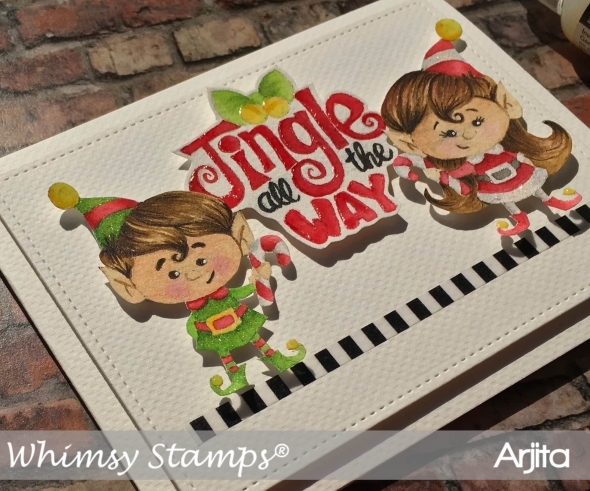 Welcome to today's blog post and I have used the adorable SANTA'S HELPER stamp set by Whimsy Stamps. I love the beautiful lil girl and the bunny, they were so much fun to colour. Welcome to the November 2018 Release at GINA K DESIGNS. 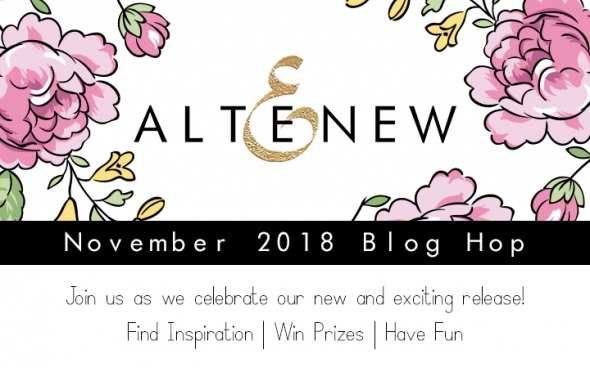 To celebrate this release we are having a blog hop where you can get some stunning inspiration from the super talented Design Team. 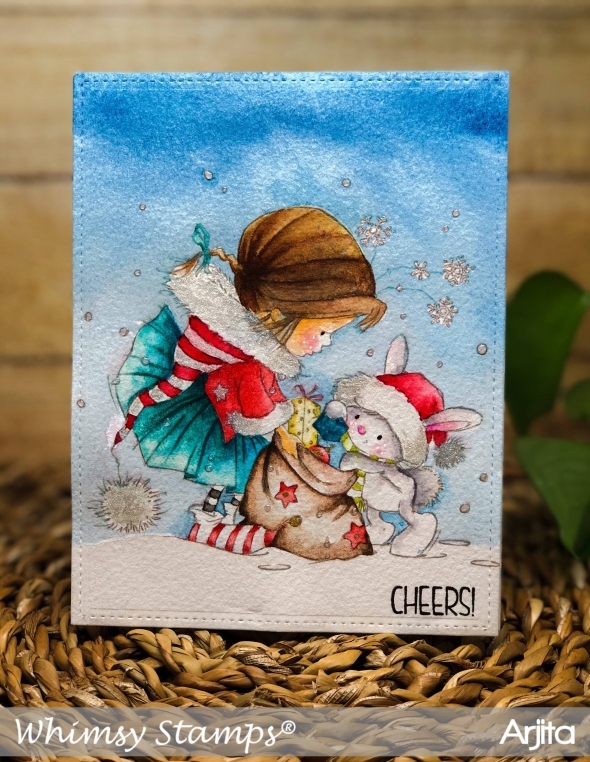 The two stamps featured today are OLD FASHIONED CHRISTMAS illustrated by the amazing Hannah Schroepfer and REASONS TO CELEBRATE by Gina K. We will be giving away a $50 gift certificate to one of the lucky winners and to be eligible all you have to do is leave us a comment on all the blogs. 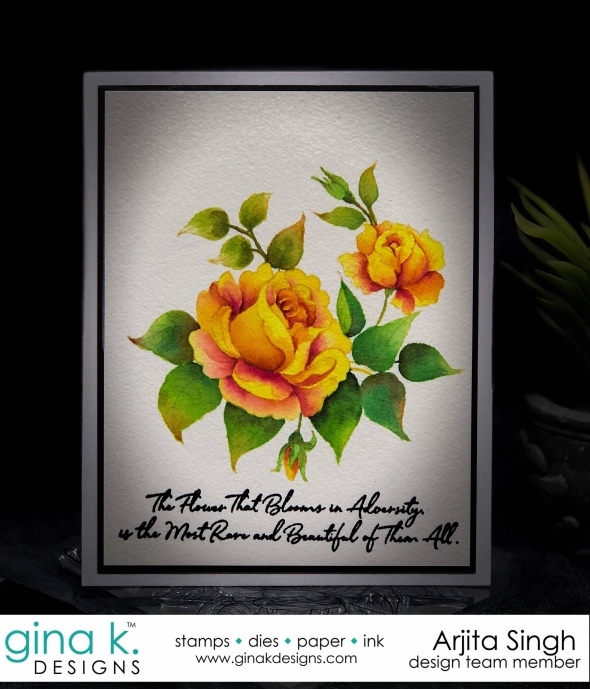 Welcome to Day 2 at the Gina K Designs September Blog Hop. 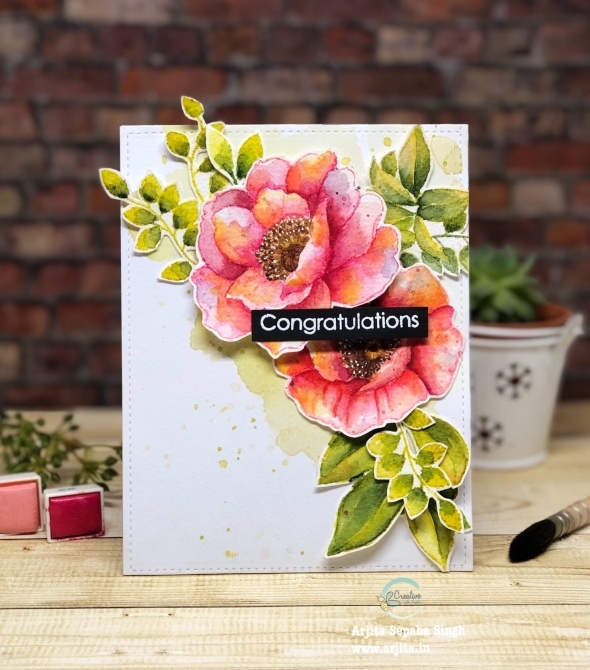 Today I have created a card using SOMETHING GOOD designed by LISA HETRICK which has some amazing floral elements and the most gorgoous wood plank stamp. I have also used the RUSTIC AUTUMMN stamp set designed by THERESA MOMBER. She has created this beautiful stamp set with a barn,some trees and a pumpkin cluster. 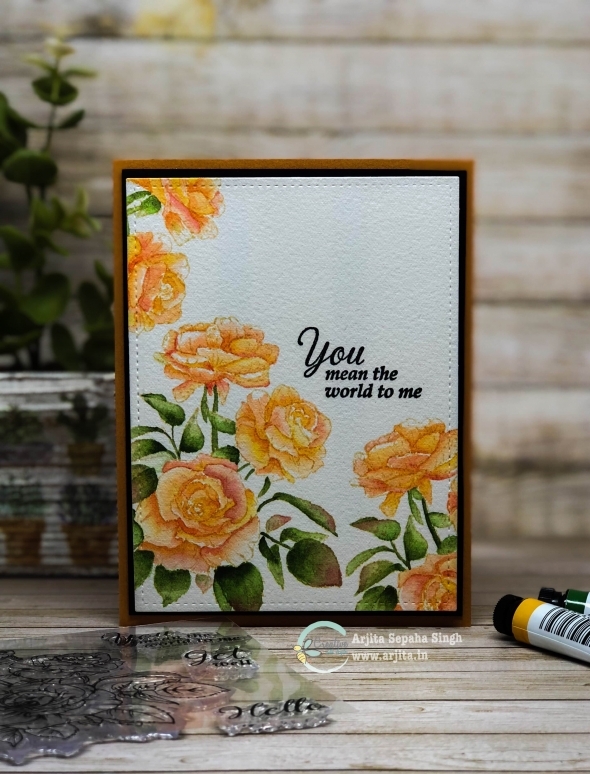 The sentiments in both the stampsets are gorgeous and can be used with many other stamps you might already have in your stash. 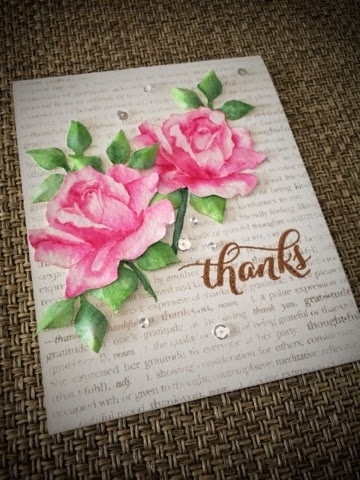 Welcome to today's post and I have used the Peaceful Roses Stamp set by Gina K Designs. 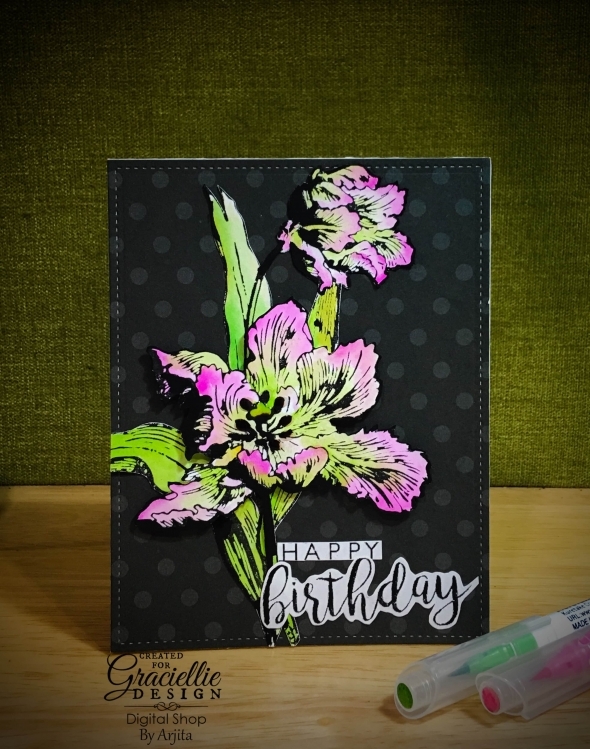 I love this flower bunch and wanted to try my hands on with Ken Oliver ColourBursts. I used the dry pigments to colour this floral today. Welcome to today's blog! 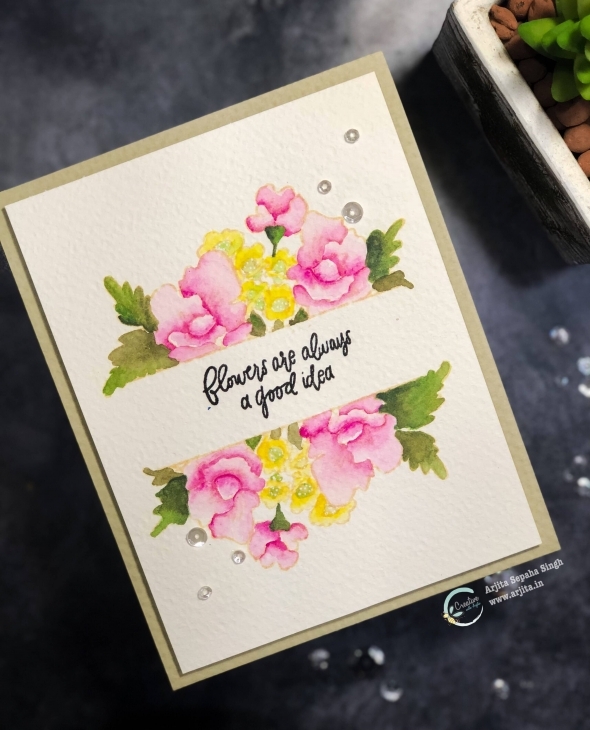 This is a first impression kinda post where I will be unboxing the Altenew Water Colour 36 Pan set and using it to paint the gorgeous blooms from Gina K Designs September Release WHIMSICAL FLOWERS STAMP SET. 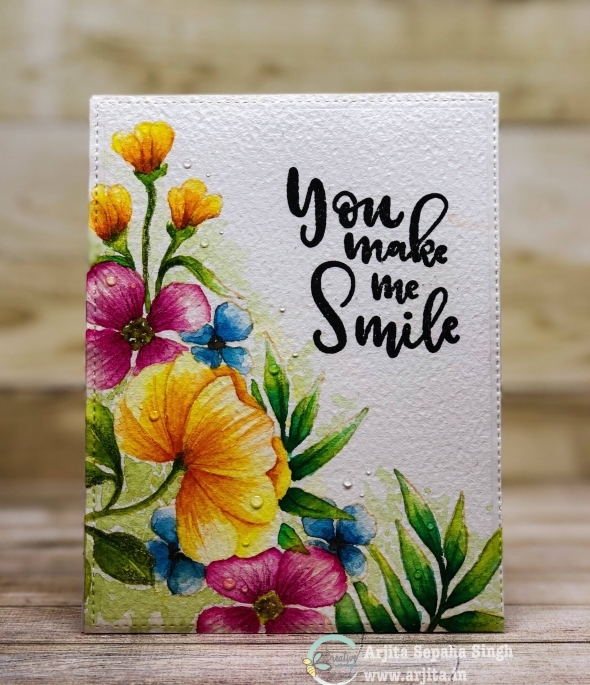 This stamp set has some beautiful flowers which are very different from each other but still look great in a cluster or bouquet. Today I have used one of the most beautiful stamps sets which is called BEAUTIFUL FLOWERS by Simon Says Stamp. 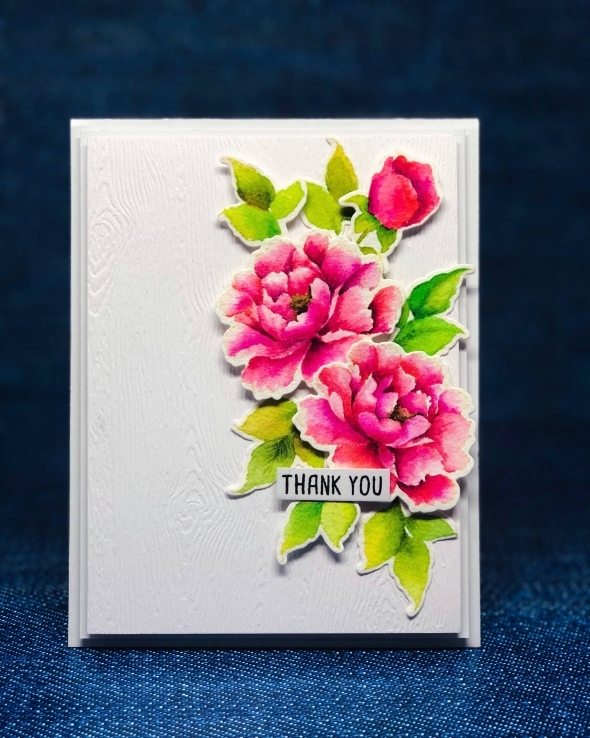 This stamp has been trending a lot and all my favorite card makers have used it to create stunning cards. So better late than never here is my version of the card. 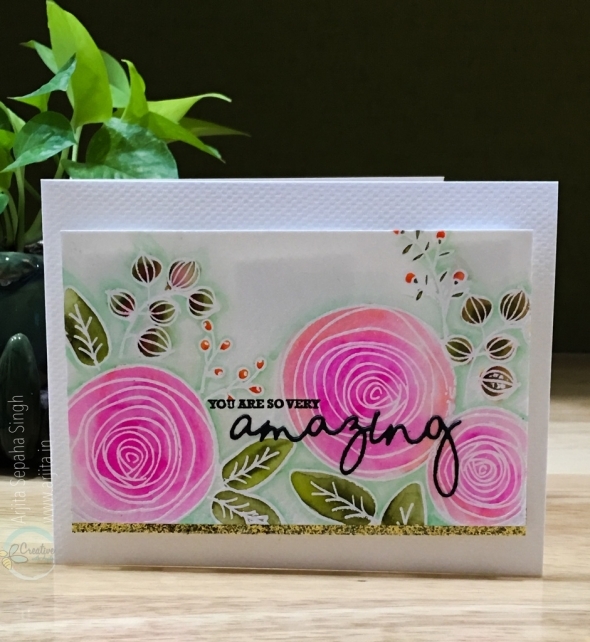 Today I am showcasing a gorgeous background stamp by Whimsy Stamps which is called CHERRY BLOSSOM. This is a beautiful rubber stmap which gives the most wonderful floral background. Hi friends, Welcome to today's blog post. I have used two older stamp set by Gina K Designs today which are beautifully illustrated by Melanie Meunchinger. 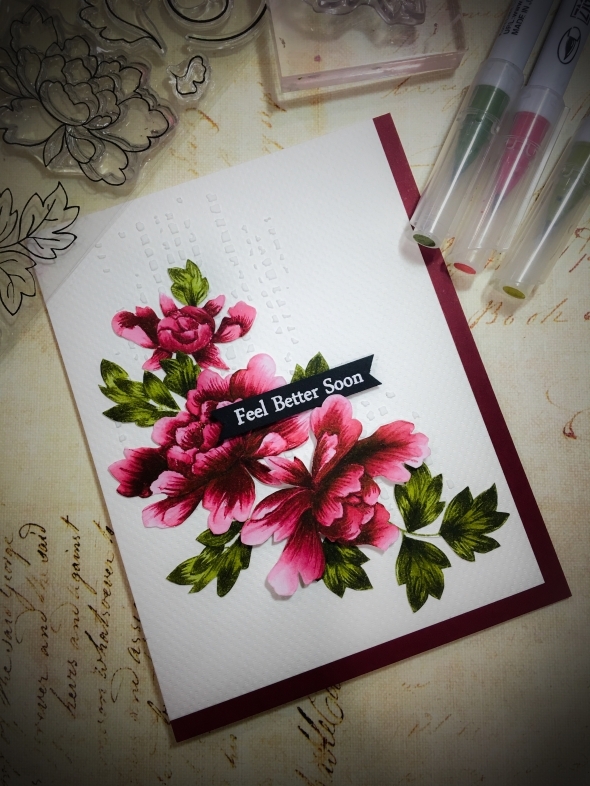 The stamp sets are full of stunning flowers and vases which can be combined in various ways. 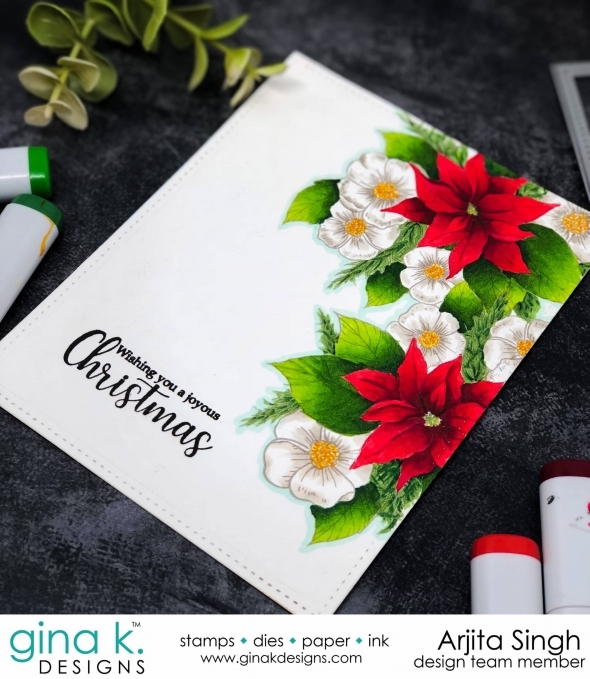 I used the Poinsettia and the planter image from these stamp sets and watercolured the images. 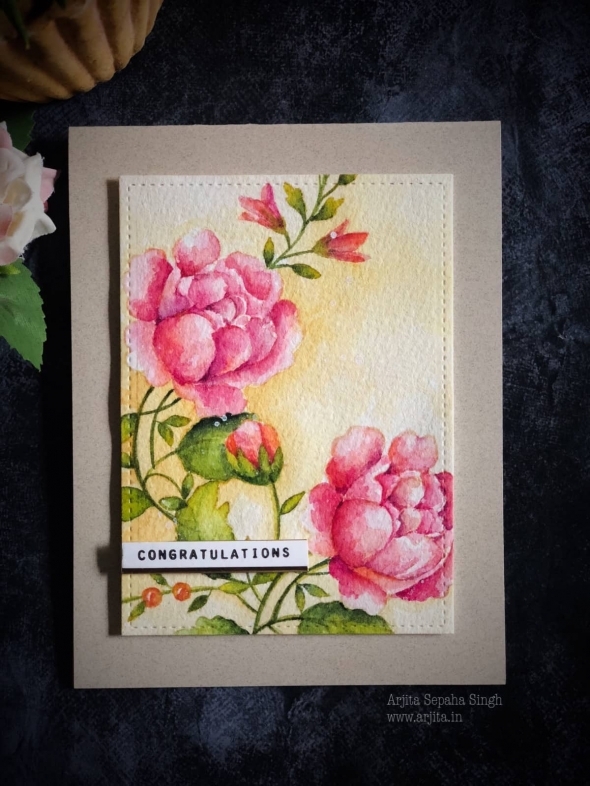 Welcome to my blog and today I have painted a card with in my favourite style which might look boring or monotonus but I love the way my card looks and I hope you will like it too. 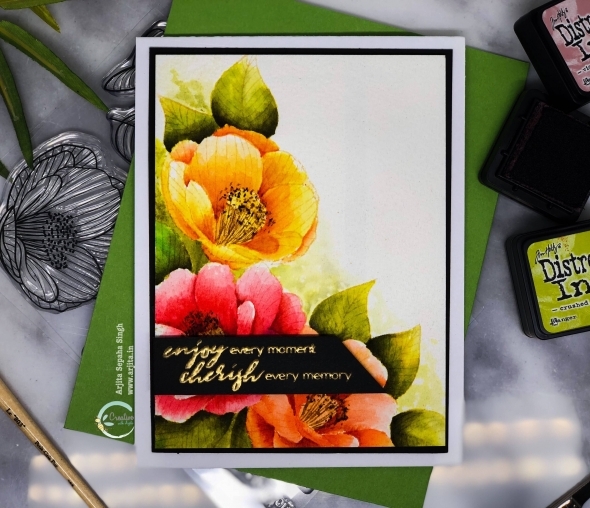 I have used a new stamp set called Cherished Memories by Altenew. 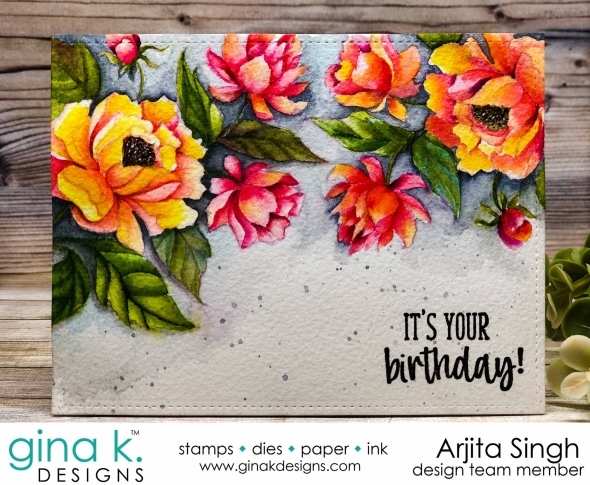 Welcome to Day 2 of the Gina K Designs Hot Summer Release Blog Hop and today we will be featuring two beautiful stamp sets. 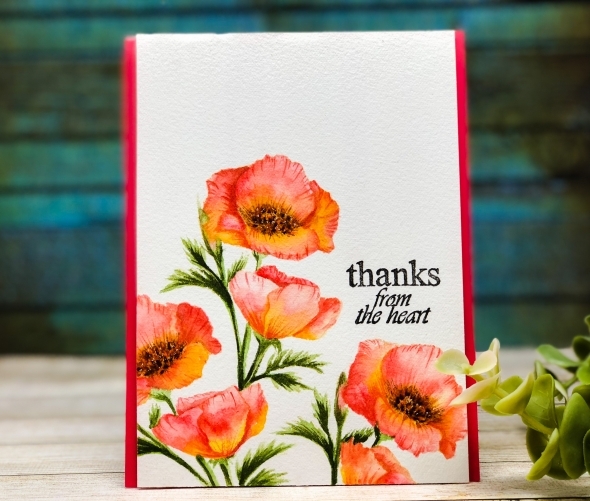 The first one is called TROPICAL TIDINGS illustrated by Theresa Momber and an incentive stamp set called INSPIRING POPPIES.We will be giving away a $50 gift certificate each day and it will be announced in the Big News Forum at StampTV a few days after the hops conclude so do not forget to leave a comment on all the blogs. 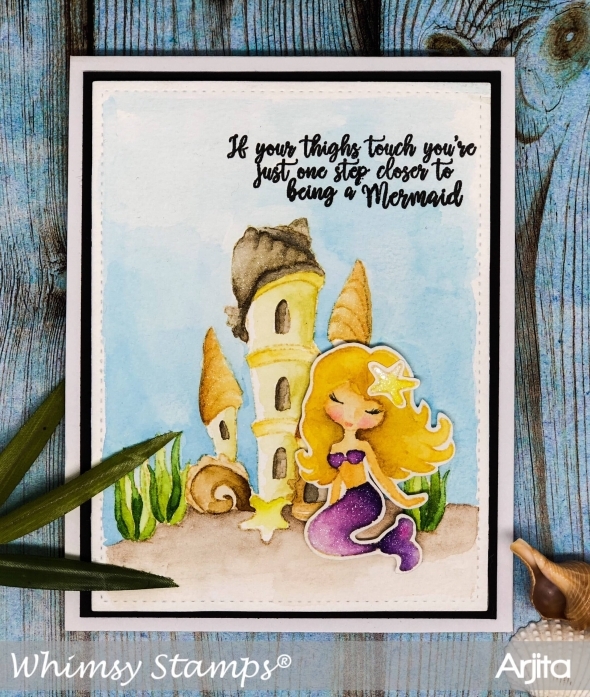 Welcome to my blog and today I will be featuring an adorable stamp set called Salty Hair released by Whimsy Stamps in July. The stamp set has a cute mermaid and her castle which can be used individually or can be clubbed together like I did in my card. Welcome to my blog. 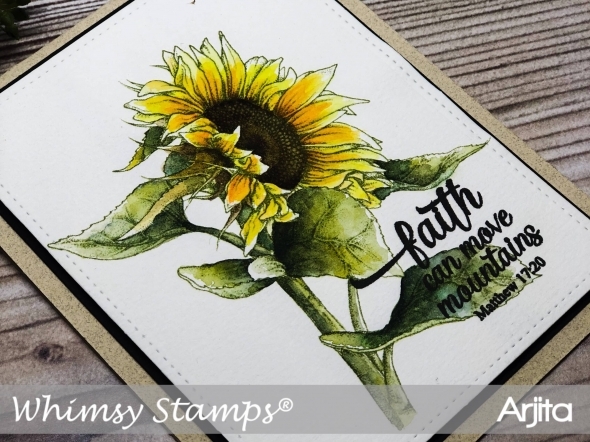 Today I am featuring a stamp set called Sunflower which is a part of the Whimsy Stamps July Release. 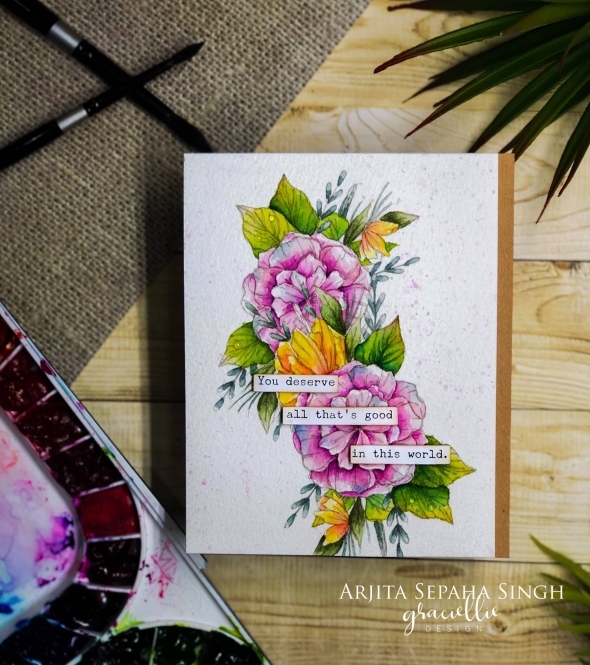 I had a lot of fun watercolouring it and it makes a simple yet beautiful card. Welcome to today's post. 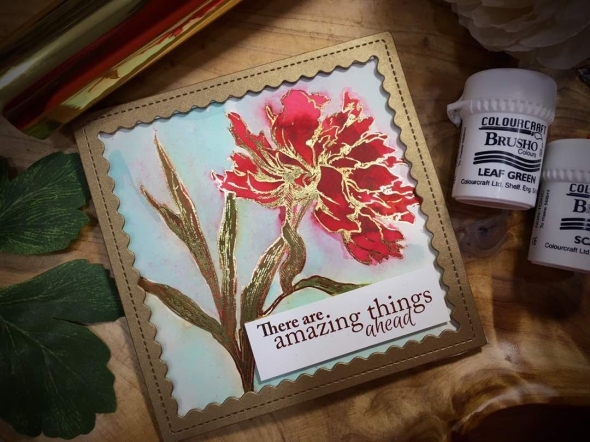 I created a beautiful flower arrangement using a stamp set by Waffle Flower Stamps. 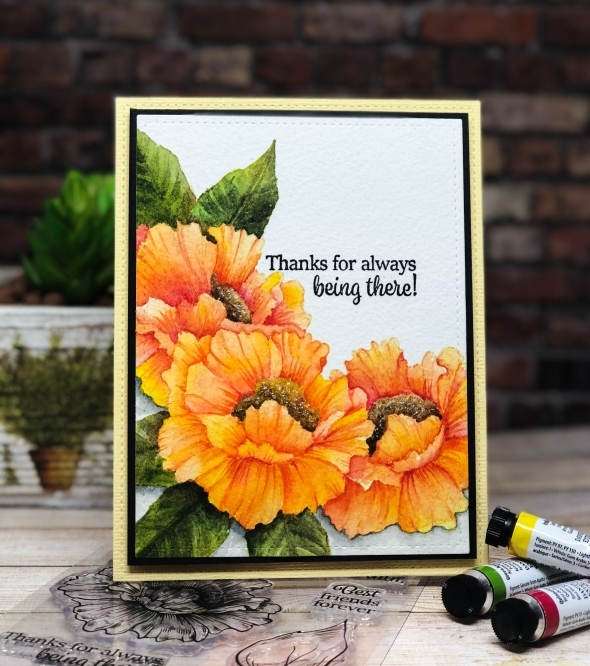 I stamped the various flowers and leaves using antique linen distress ink. I created some masks with post it sheets and used them to create this layered look. 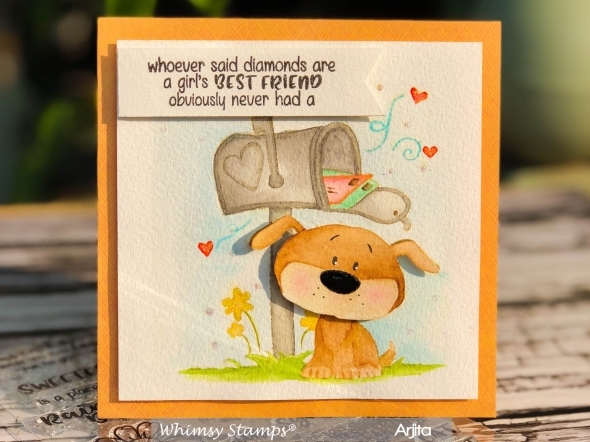 The new stamp sets released by Whimsy Stamps for June are my absolute favorite till now. I am a huge dog lover and the stamp set I used today brought back all the memories because of the beautiful images and sentiments. I lost three of my beautiful companions last year and this card is a tribute to them. 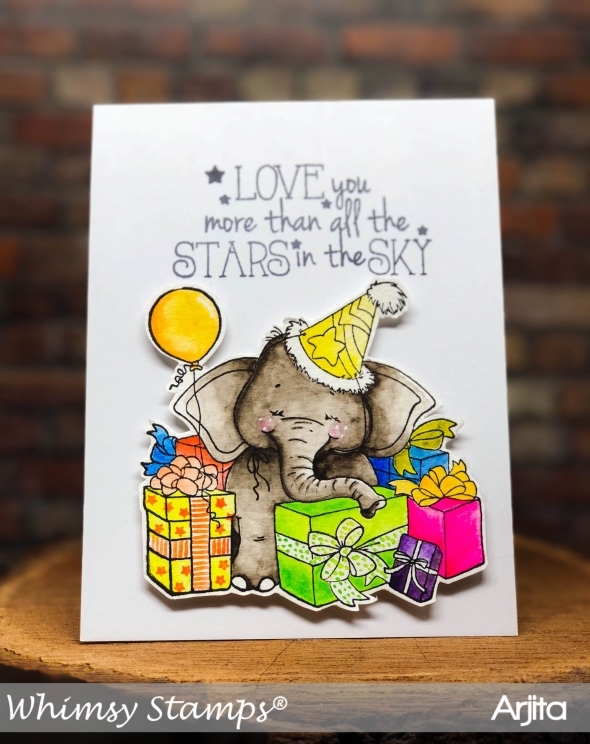 Today's card is super adorable and it was so much fun to colour this old Whimsy Stamp Image. The elephant looks so cute with gifts all around him. I coloured the image with Mijello Mission Gold water colours and stamped the image with Gina K Amalgum ink on Canson paper. 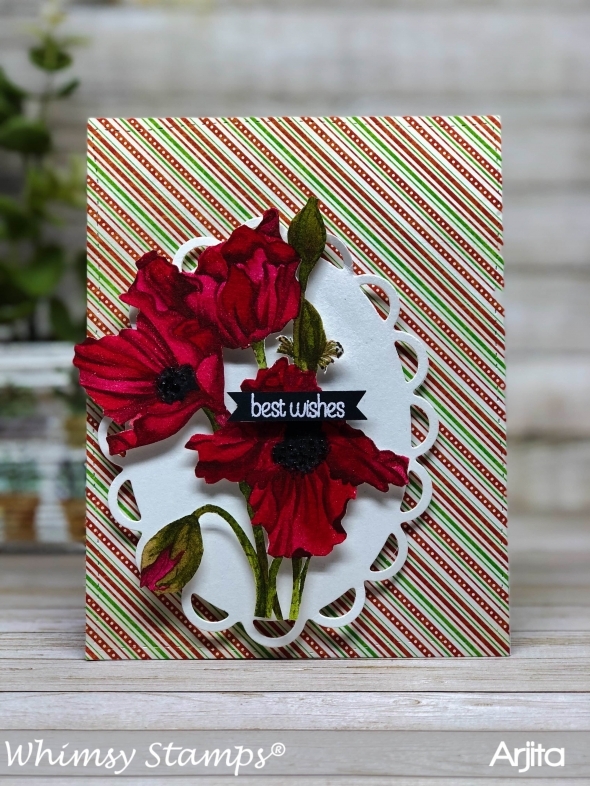 Today's card features the Anemone Wishes and Petite Flourish Stamp set by Gina K designs. 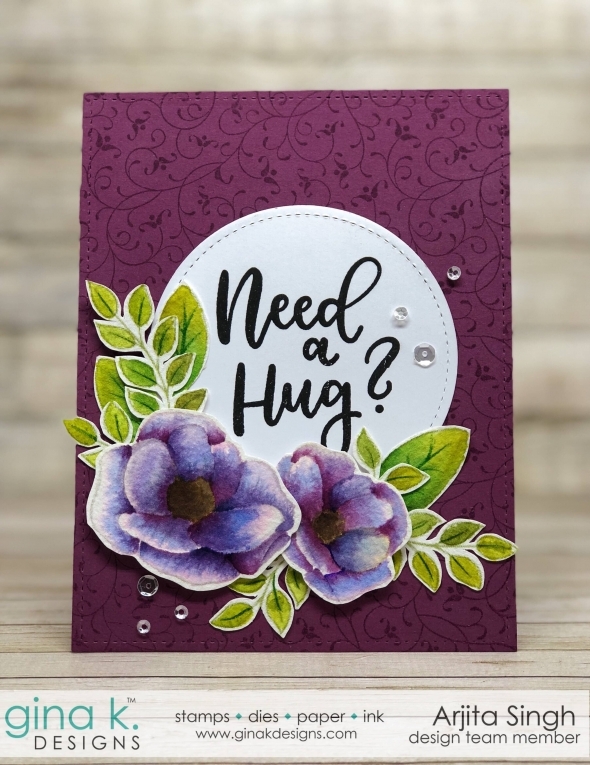 I stamped the flourish stamp with some Plum Punch ink on Plum Punch card stock to get a delicate tone on tone effect. 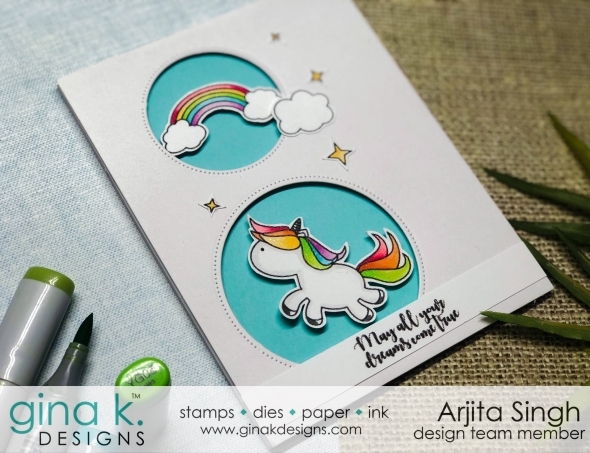 Welcome to Day 1 of the May Release Blog Hop showcasing two gorgeous stamp sets brought to you by Gina K Designs. The First set is called WOMEN OF FAITH designed by Melanie Muenchinger and the second set is called ANEMONE WISHES designed by Emily Schroepfer. Today's card is one of my favorite ones beause of the super bright and beautiful outcome. 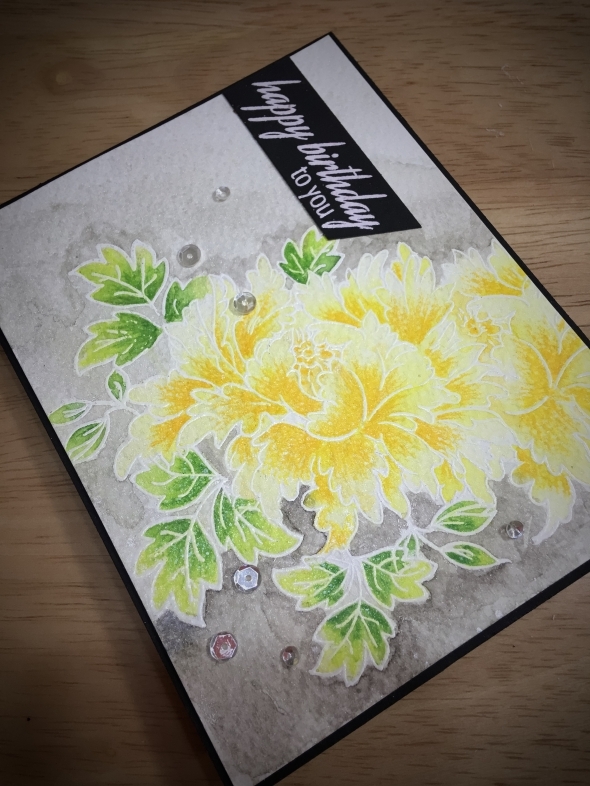 I used the gorgeous stippled flowers Stamp and die set by Gina K Designs to create this card. I am super excited to share the process of creating this card with all of you. Welcome to Day 2 at the Gina K Designs March Preview. I am showcasing two beautiful stamp sets called Liam and Liz Lion designed by the super talented Beth Silaika and the second one is called Hello Beautiful designed by wonderful Lisa Hetrick. 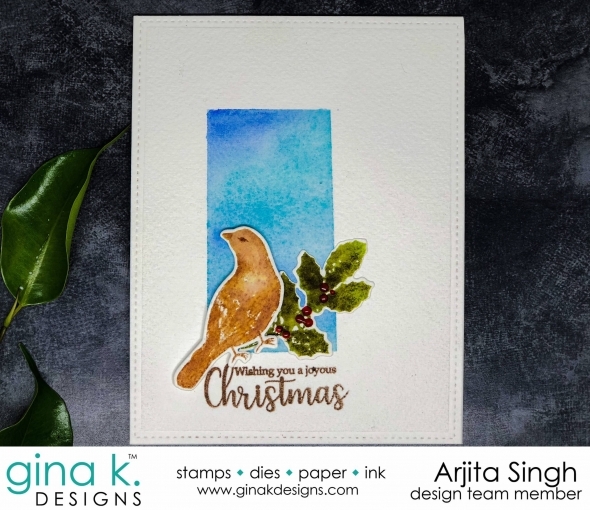 I am so excited to be hopping along with the Gina K. Designs design team and we will be sharing projects created using both the lovely stamp sets. 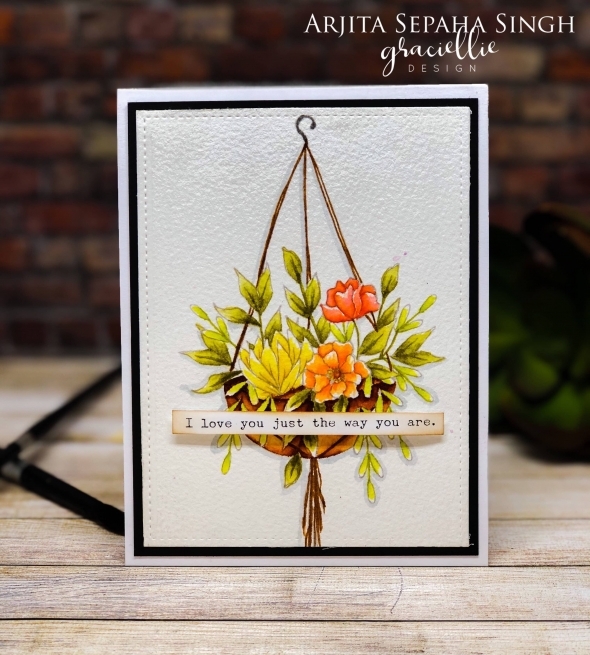 Welcome back to my blog and for today I have this gorgeous card for which I used a stamp set by Gina K Designs. 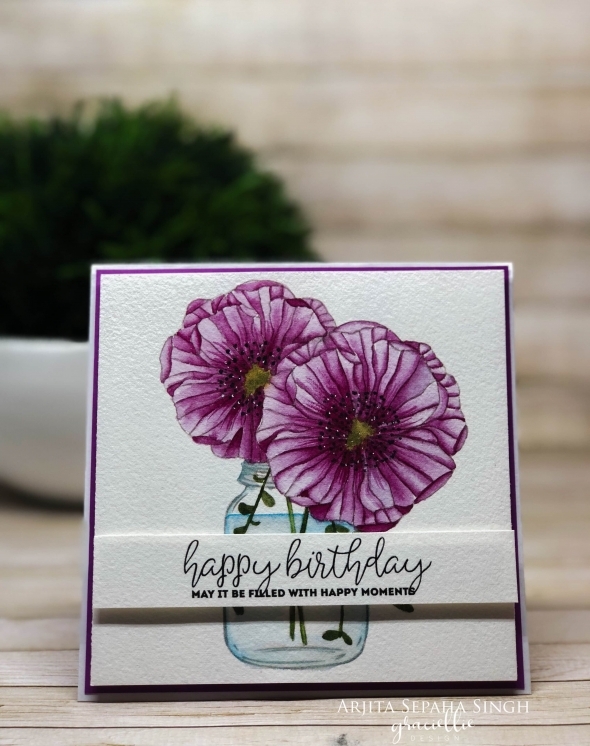 The stamp set is called THROUGH THICK and THIN and has this beautiful big bloom which I watercoloured. 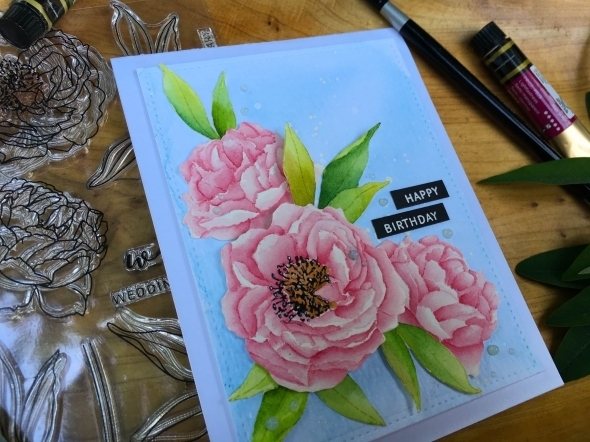 I am obsessed with realistic floral stamps and ever since Doveart stamps are available at www.whimsystamps.com I am super happy. 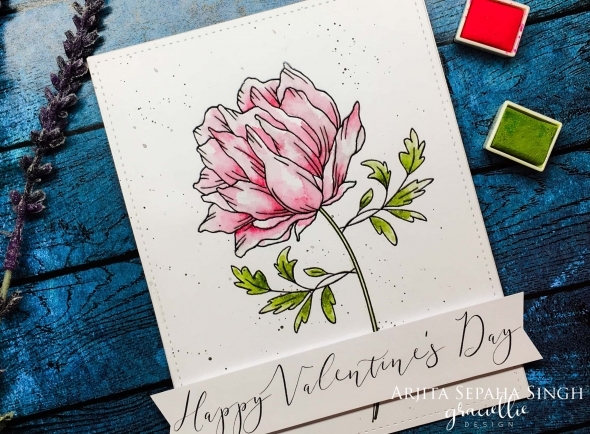 For today's card I coloured the gorgeous Himayalan Poppy in deep red colors using watercolours. 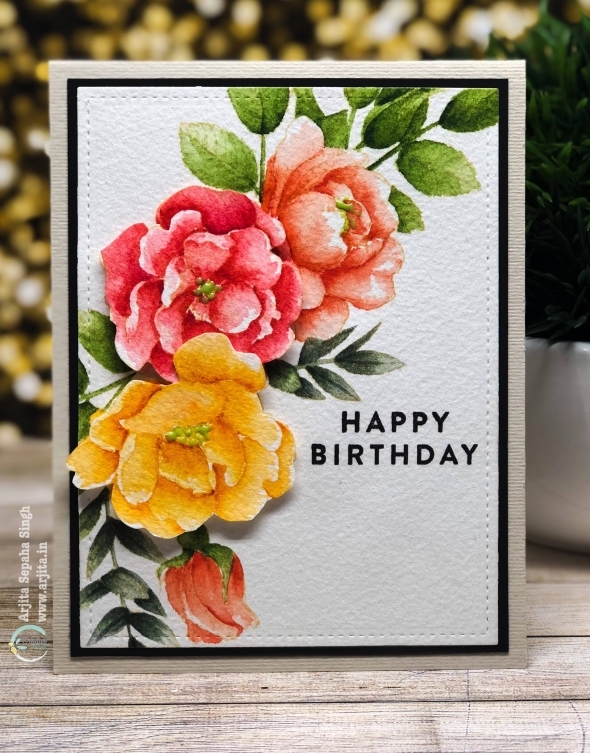 Today I have another floral card for you. 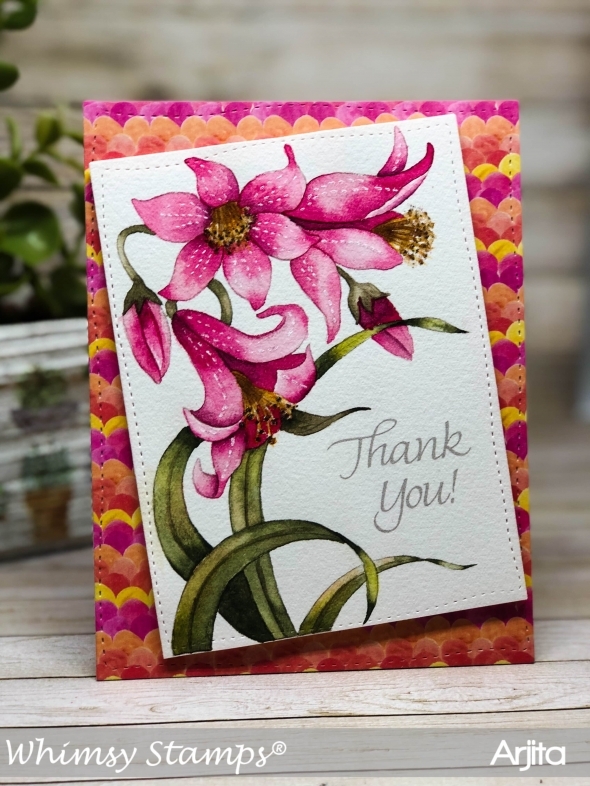 Lilies are one of my favorite flowers and when I saw the gorgeous Flower Lily stamp by Doveart I was thrilled. 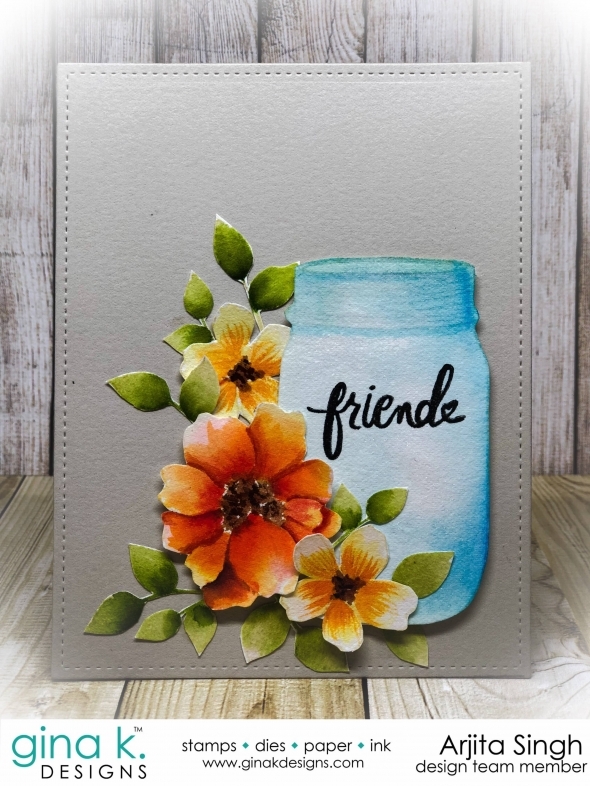 Welcome to Day 5 of the New March Release at Whimsy Stamps. All the stamps in this collection are available for sale at www.whimsystamps.com so visit the store and grab all the gorgeous stamps:) For today's card I used the cutest of all the stamps and is called Donut Birthdays designed by the talented Krista Heij-Barber. I am super happy and excited to be a part of the Gina K Designs February Release Blog Hop. 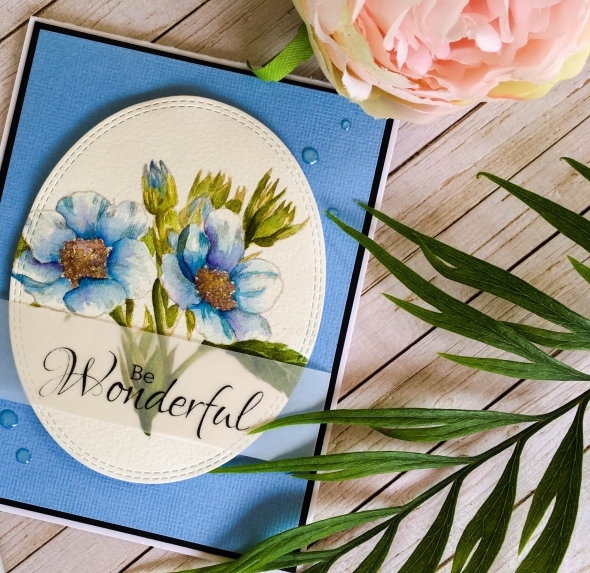 I am on cloud nine as I could use the gorgeous Stippled Flowers stamp and created this watercolour card panel. Welcome back to my blog! Today's card is again a watercolour one and I used a gorgeous stamp by Gina K designs from the Stately Flowers 1 set. 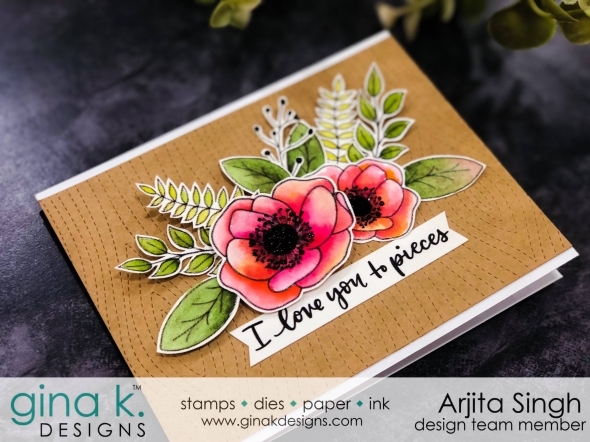 Today's post is very special to me as I could use Gina K stamps which I got during my visit to Phoenix. 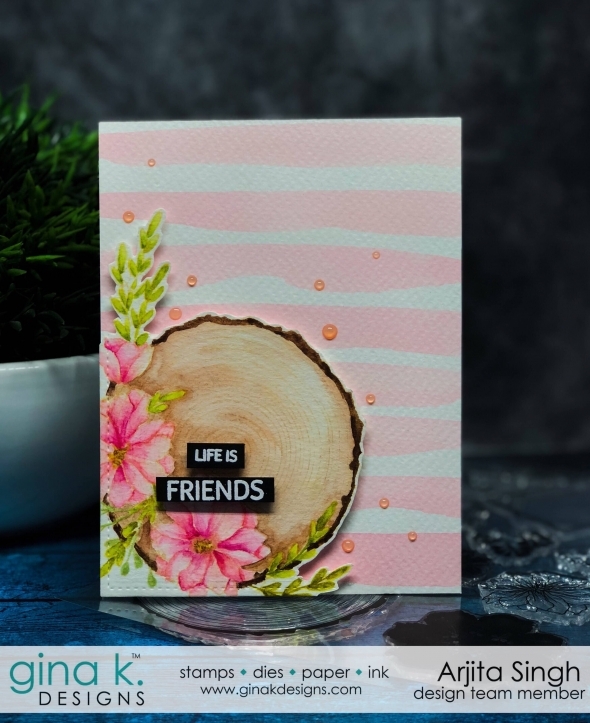 As I always say I entered the world of cardmaking by watching Gina and Stamp TV and it feels so wonderful to create something using her stamps. 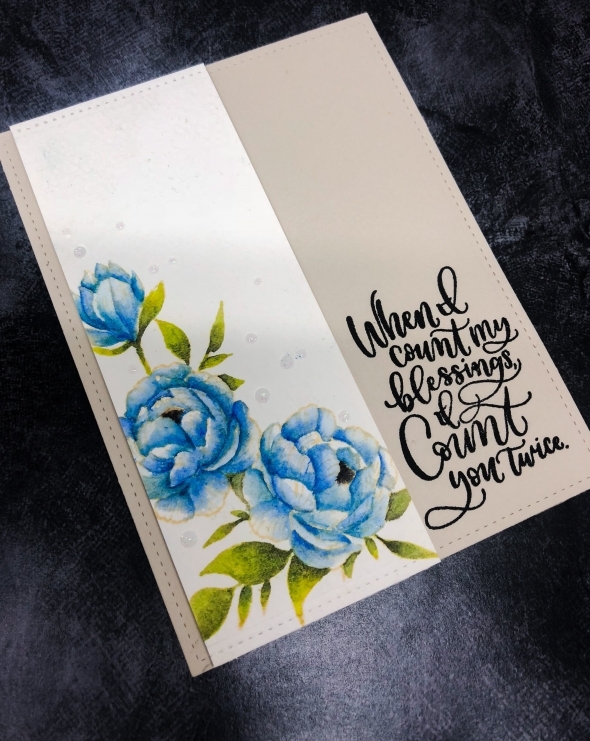 For today's card I used a gorgeous stamp called Rose Bouquet and did some watercoloring. 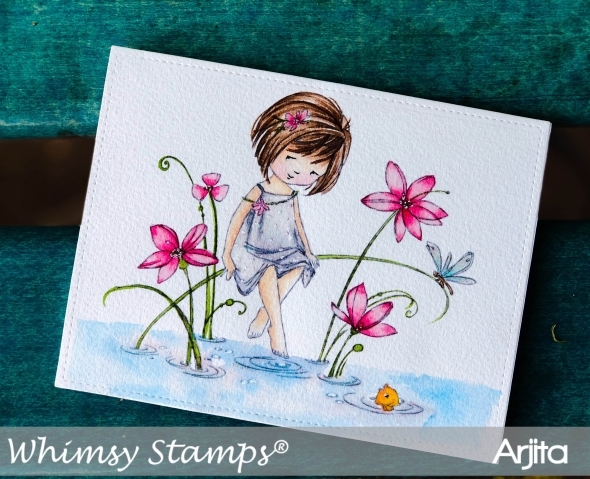 I love the innocence of the fairy images by Whimsy Stamps. I also enjoy coloring them with various mediums and they can be a varity of results you can achieve. For today's card I coloured the image with watercolours. I kept the card very simple. I feel so excited just like a little child whenever I see my Daniel Smith watercolours, they are undoubtebly the best watercolours in the market. 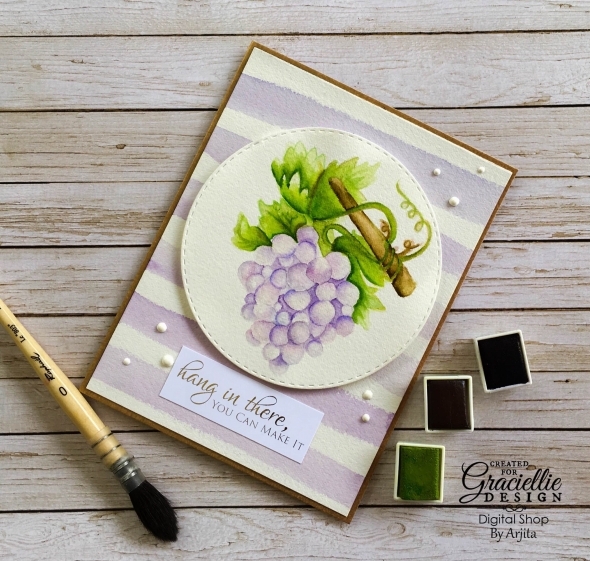 I have been enjoying watercoloring so much that I made yet another card using the new stamps released by Doveart which is now available at Whimsy Stamp. 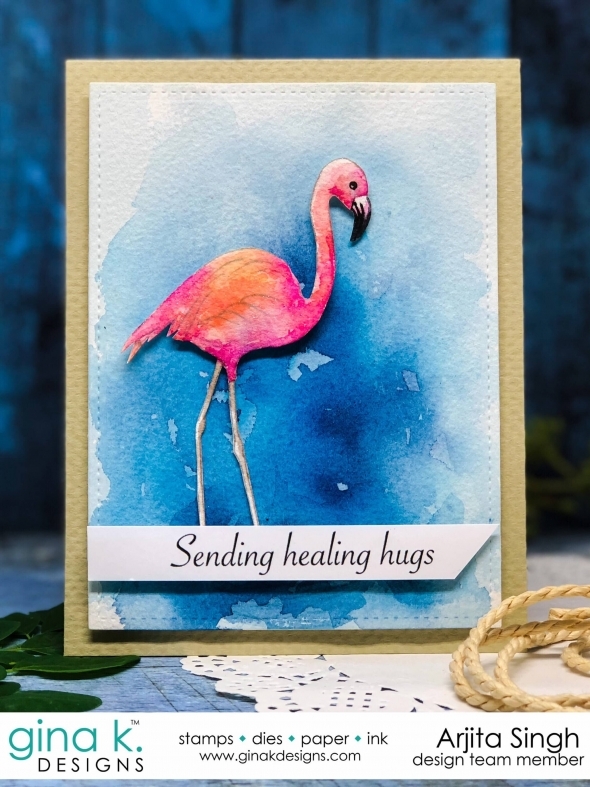 I am over the moon ever since I got my Daniel Smith watercolors, I am just enjoying watercoloring and there are so many gorgeous stamps released by Whimsy Stamps which are perfect to colour. Today I used a stamp set by Doveart called the Bouquet. Its a beautiful image to colour with any coloring medium. 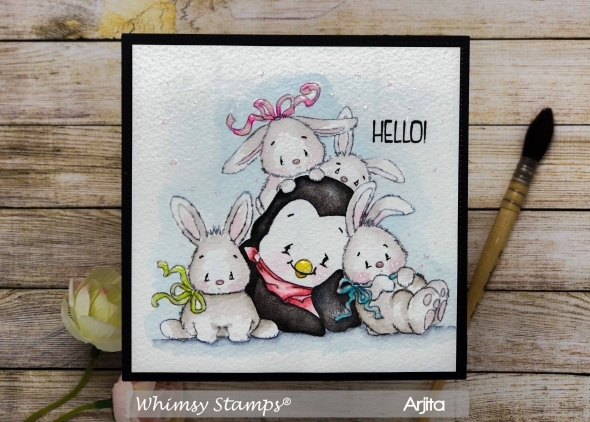 Today's card is a super cute one which I created using Penguin Bunnies stamp set.There are some fabulous new release stamps at Whimsy Stamps and you can check it right here www.whimsystamps.com. 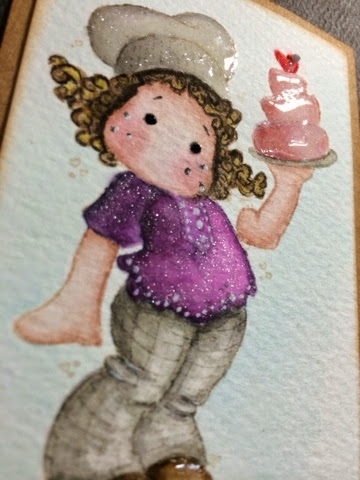 For this card I used Daniel Smith and Mijello Mission Gold watercolours to paint the images. 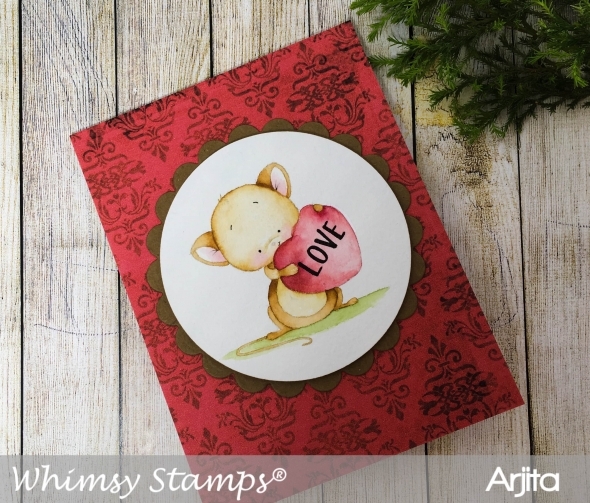 Its February and its time for the New release at Whimsy Stamps. I am in love with the beautiful images created for this month. For Today I have used the stamp set call Teddy with a Heart. I used Daniel Smith Watercolours to colour the image and tried to get a fur effect. Its hard to believe but January 2018 is about to get over and we will be entering in Feb soon. 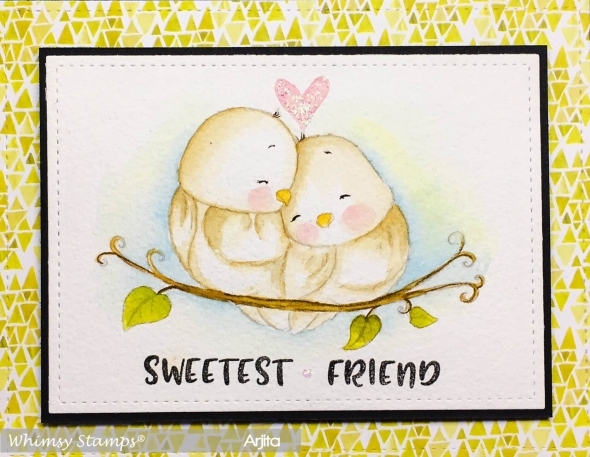 Feburary is the month of love and romance and so I created this syper adorable card using the Love birds stamp set by Whimsy Stamps. I am a huge dog lover and today's card is dedicated to my new fur baby who is an adorable Shitzu and I am in love with his cute face & expression. 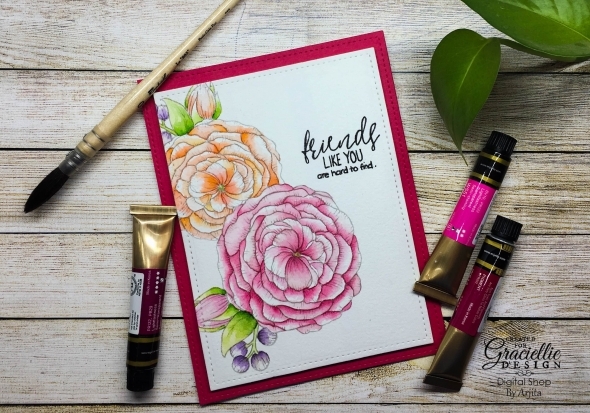 I used a new stamp set by Whimsy Stamps called "A girl's best friend". Used the Dog and an old mail box image by Whimsy Stamps. The month of January and Feb are months of romance and love. 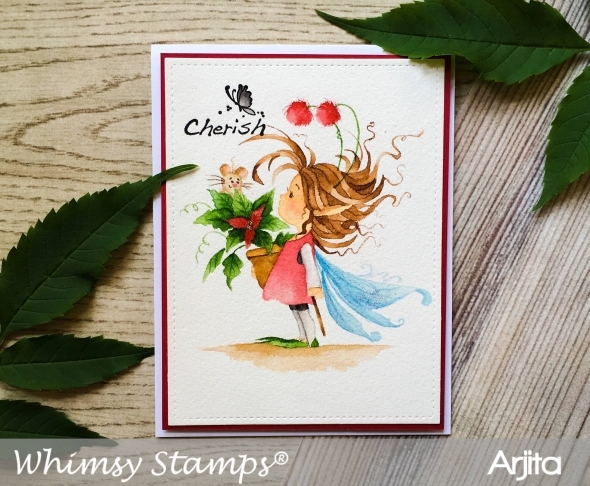 Whimsy stamps are the best ones when it comes to cute romantic images. I love these adorable birdies who look so romantic and cute. The card for today is my most favourite one as it has the most adorable mouse. I coloured the mouse using watercolours and achieved a beautiful no line colouring effect. 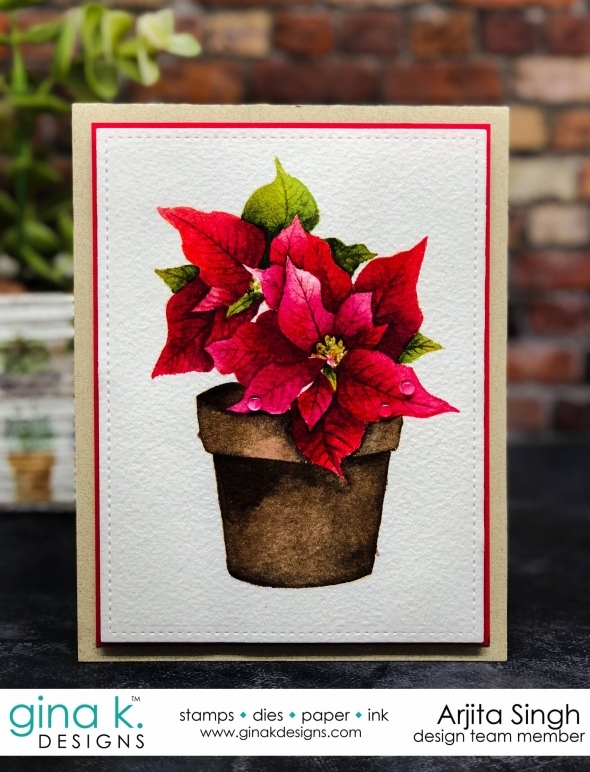 I created this card using my Mijello Mission Gold watercolors and an adorable Wee stamp set called Poinsettia by Whimsy Stamps. 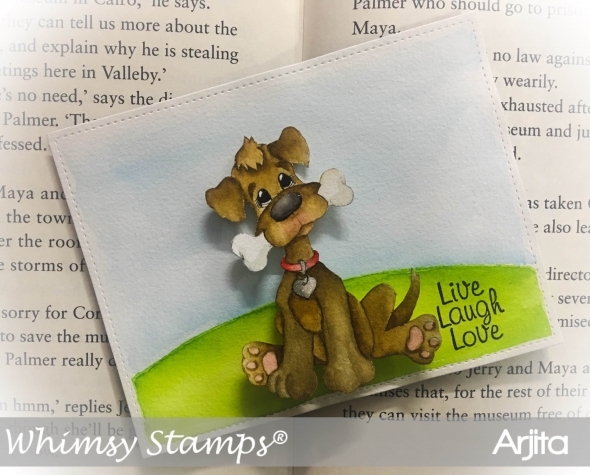 The stamp is designed by the talented Sylvia Zet for Whimsy Stamps. I stamped it on some Arches cold press water paper using some very light ink. I am a huge dog lover and this card is dedicated to my Lab Bruno whom we lost last month. He was the most cuddly well behaved dog and was a very important member of my family. He left us at the age of 13 and has given us some wonderful memories and moments we will cherish forever. This Stamp set is one of the cutest ones and I decided to make it more interesting by adding an action wobbler to it. Todays card is a cute Christmas card created using a new rubber stamp by Whimsy Stamps. I stamped the kids and the sentiment with a light ink and coloured them with watercolours. Today's card is a bit different for me as it does not have any florals .I picked a stamp set form Altenew with various triangles and I created an abstract geometric card front. 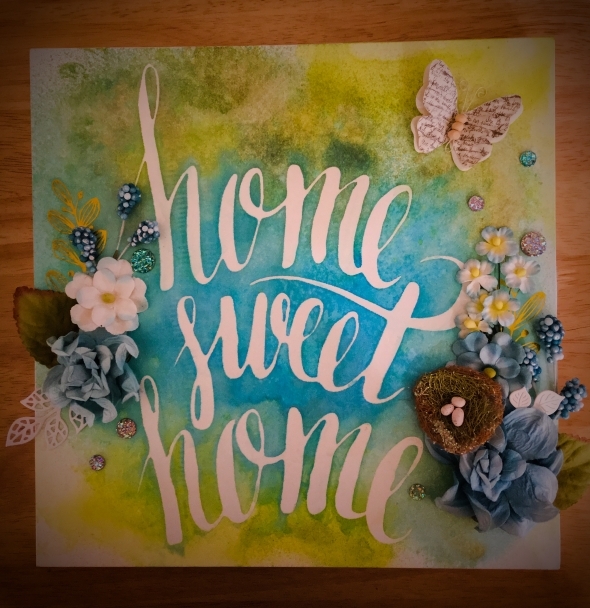 I heat embossed some triangles on a watercolour paper and used a pale golden embossing powder for it. I am super excited to share today's card with all of you since I think it turned out beautiful and I am sure you will love it too. This was not a very easy card to create since the stamp by Wplus9 is so detailed ...but extremly gorgoeus. I spent around 3-4 hours colouring it and enjoyed it completely. I picked up two of the most gorgeous stamps sets by Altenew and they can be used with each other perfectly. 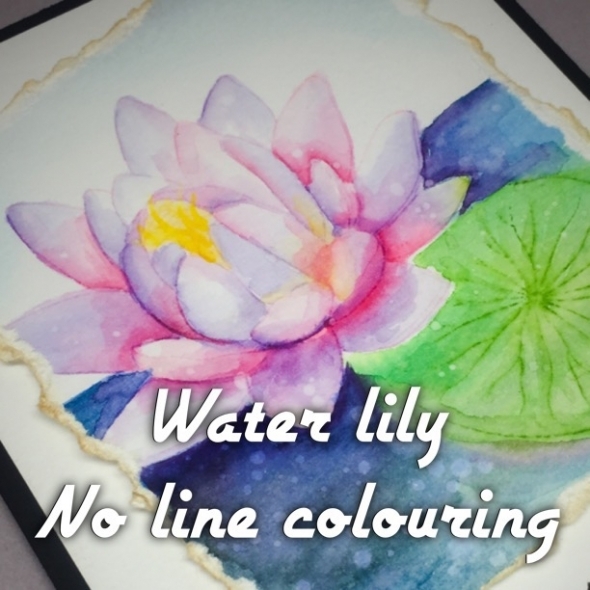 I love colouring flowers with water colours and for today's post I used my all time favorite mijello mission gold water colours. They are beautifully pigmented and smooth to work with. 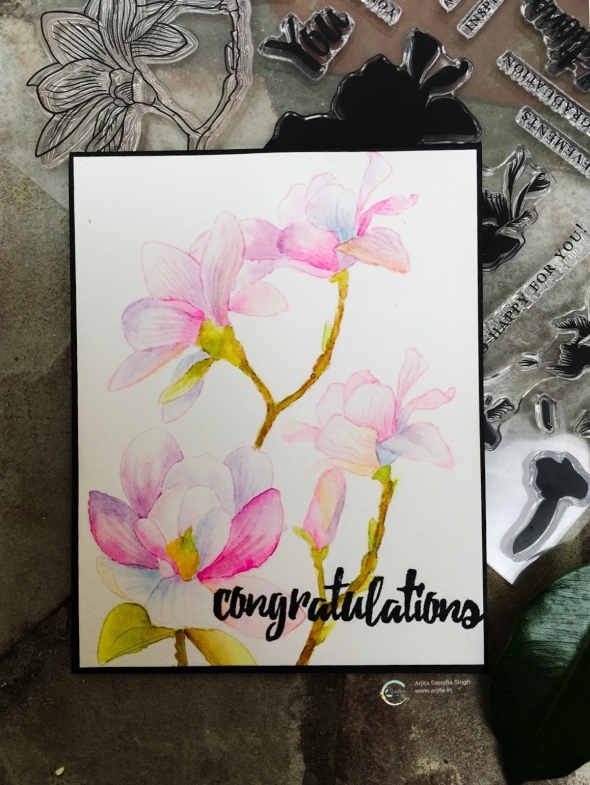 I stamped the magnolias with some spun sugar distress ink so that the ink will blend and it woud appear to be a no line effect. 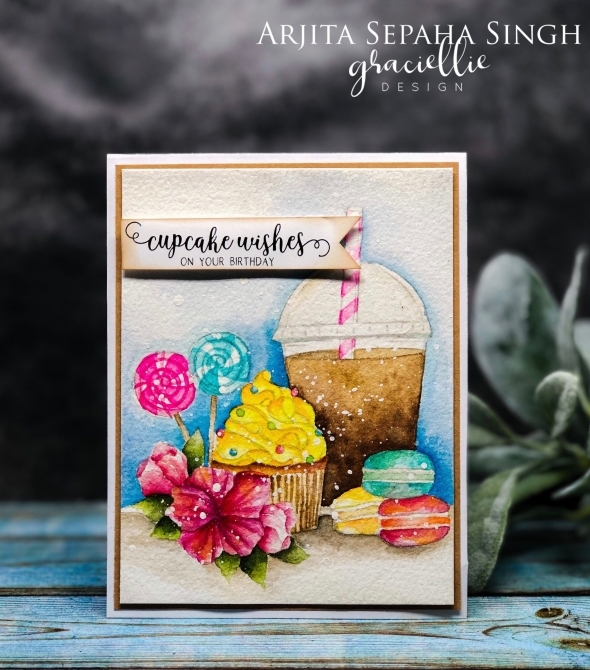 Hi friends, Its time for the May release & blog hop at Graciellie design and I am so excited to share this card since this style is very new to me and I thoroughly enjoyed making it. I had the Minc machine since a couple of months but wasn't using it apart from foiling few sentiments etc. But after getting to understand the world of digital stamps I wanted to try foiling the images and colour them using various mediums. 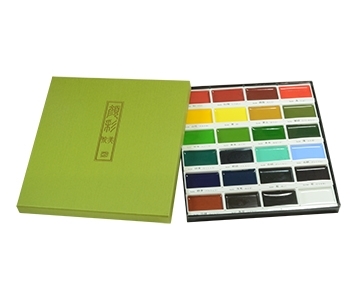 The best way to colour them is watercoloring as the foil acts as a resist and we get beautiful results quickly. Hi friends, Hope u all are enjoying the new year... I was a bit occupied which kept me away from crafting for some time. 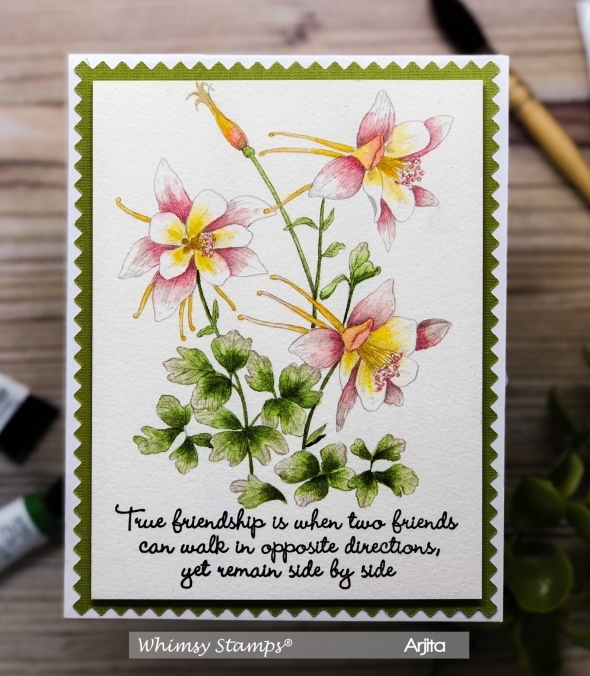 But today I finally got my hands on the gorgeous Altenew stamps and I created a card. Hello guys, I bought a few Rosie's DIY watercolour decor frames during my visit to NZ and they are so easy to make.Just add few water colour tubes or sprays and they are perfect Christmas gifts to someone who enjoys colouring . 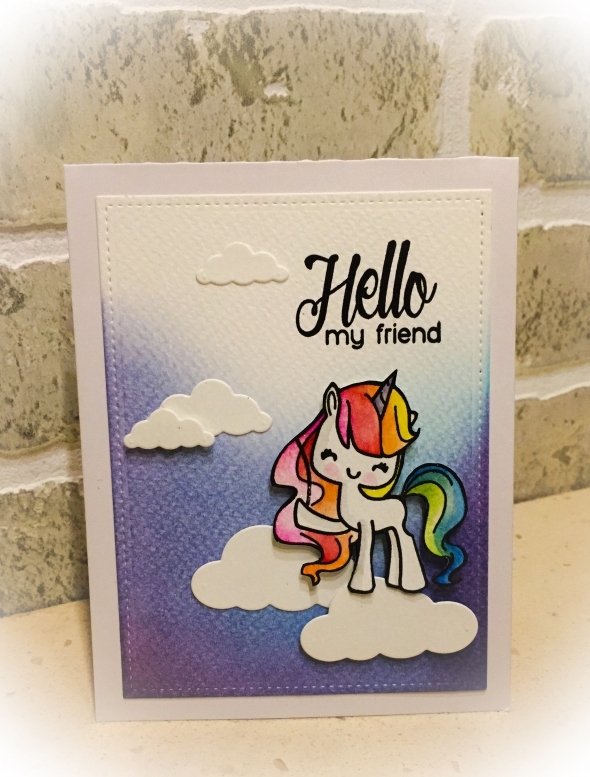 Hi friends, I love to make dreamy magical cards, there are so many cute stamps with cute fairies ,mermaids and unicorns in the market and I got one which had the most adorable unicorn. 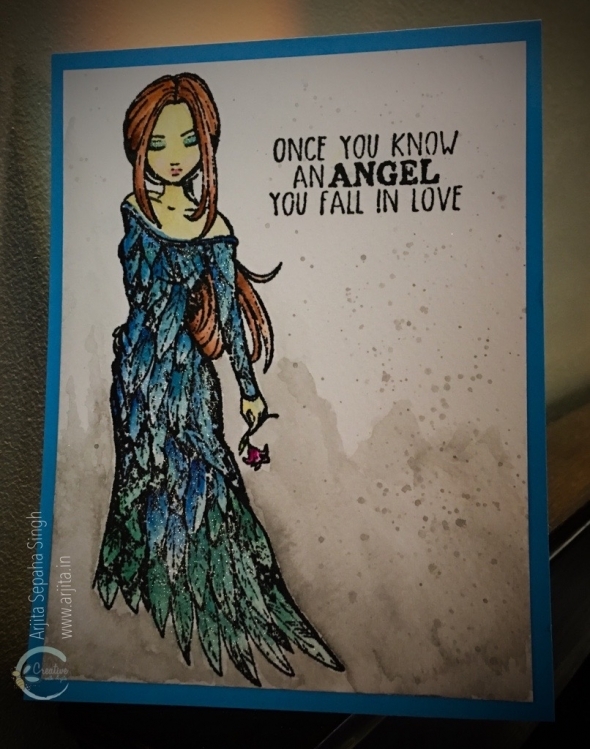 Hi eveyone, I created a card using the Angel Stamp by Carabelle. The stamp is so gorgeous and was so much fun to paint. I used my Mijello Mission gold water colours and the result was so beautiful. 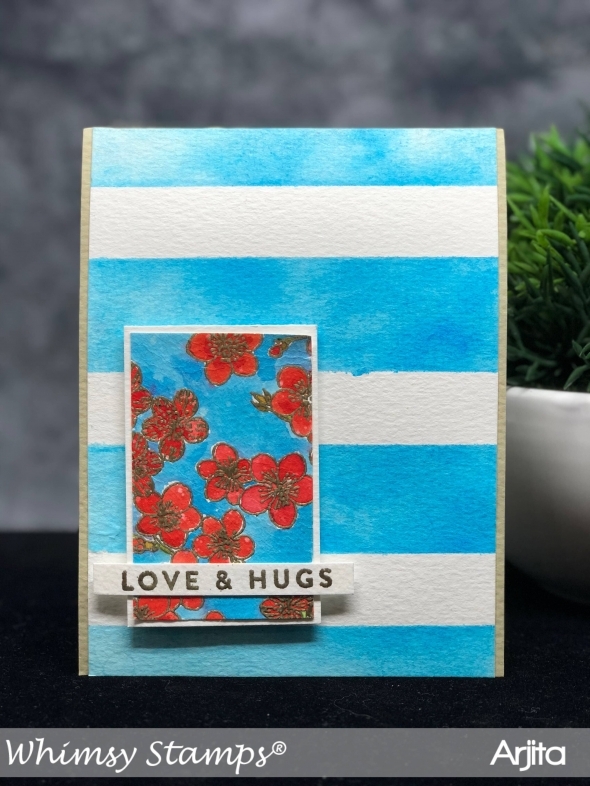 Hi everyone, For today's card I used the Simon Says Stamp Sketch Rununculus Stamp set. Hello everyone, This is my second take on the Altenew June challenge and I had to make a rose with my favourite style of colouring. 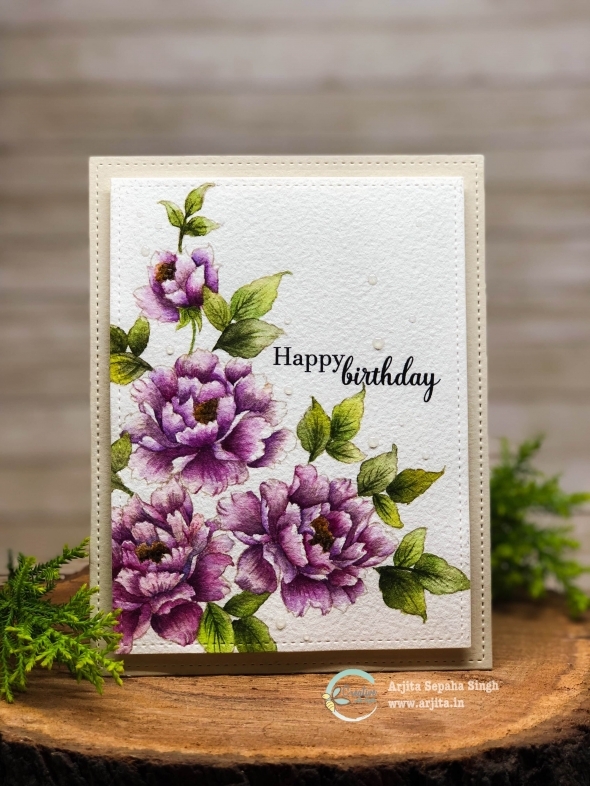 I love the Altenew stamps and chose the gorgeous majestic blooms for today's card. 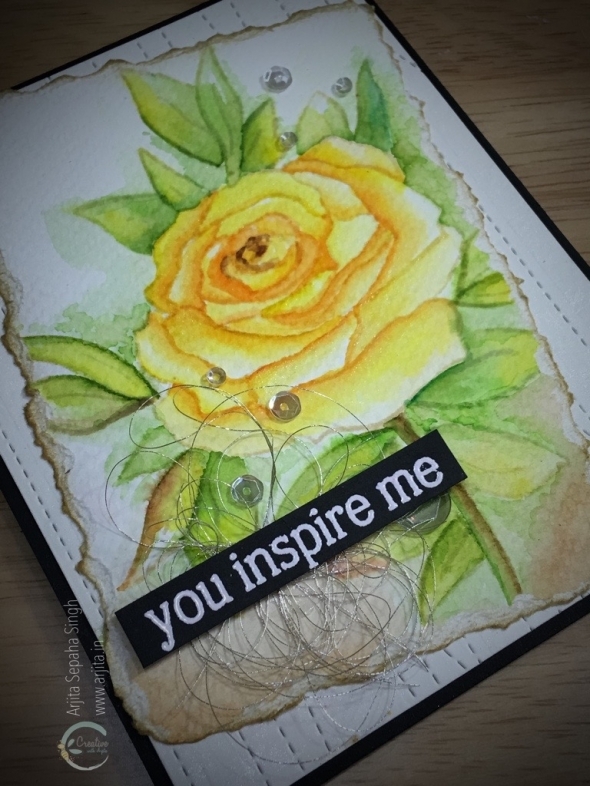 Its a subtle yellow flower created with Mijello mission watercolours and prima coloured pencils. 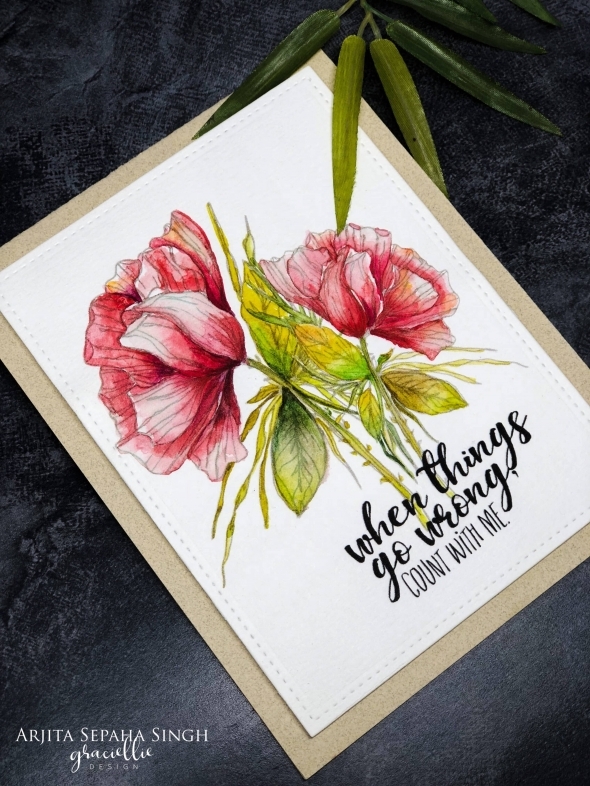 Hello friends, Altenew always comes up with gorgeous flowers and sentiments in their new releases. 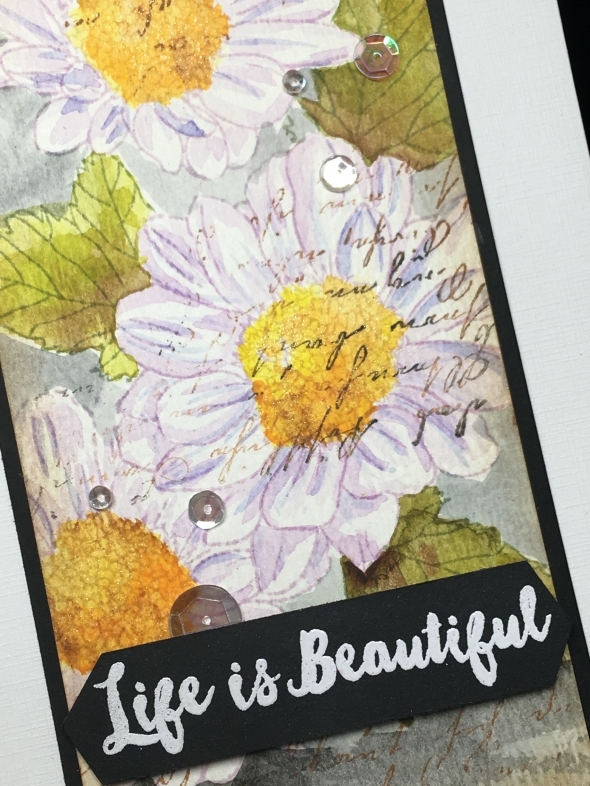 I got my hands on the May release and this beautiful Daisy stamp set was my favourite. Its a unique one and I had so much fun painting it. 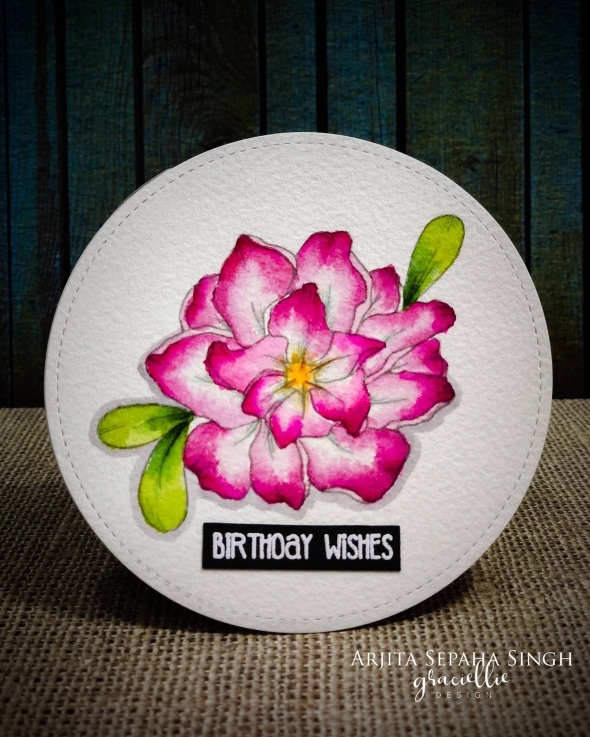 Hi , Water colouring is my new love and the moment I saw this gorgeous water lily stamp set by Mudra Stamps which is designed and made in India I wanted to try it with noline colouring. 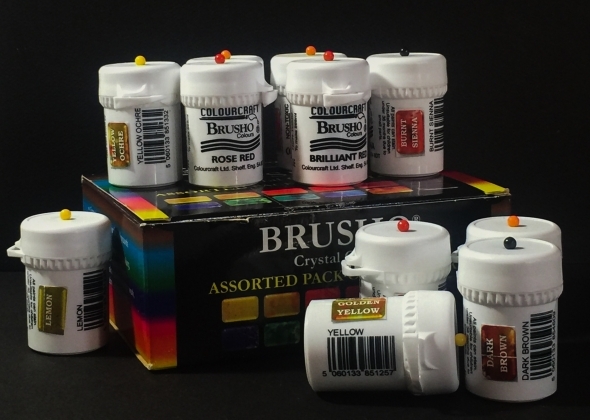 I am obsessed with watercolours and the latest one in my collection is something very unique called Brusho colour crystals. 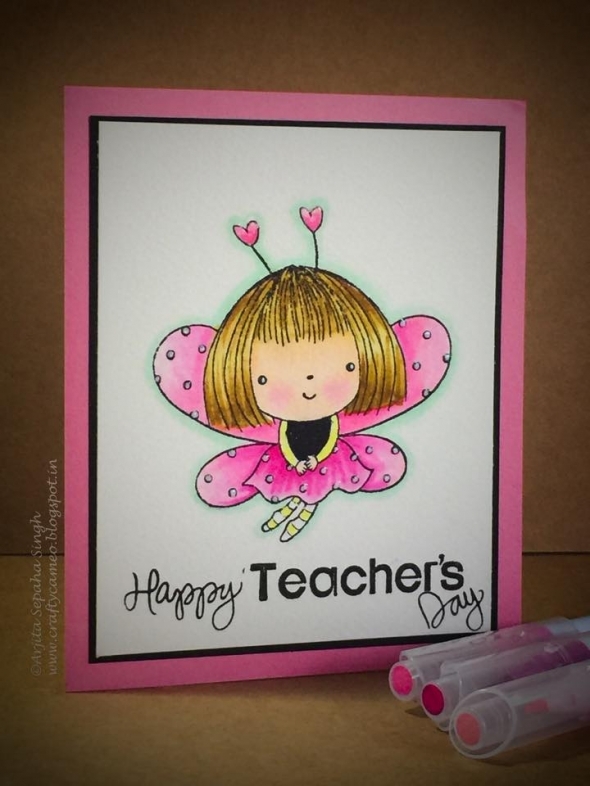 Teacher's day is a very special celebration to let our teachers how much we love them. I always create a bunch of cards for my daughter's teachers. 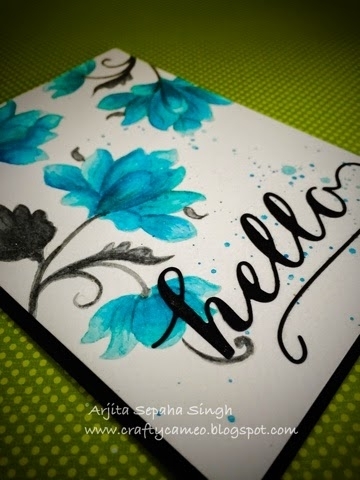 Hi friends, I love experimenting with colouring mediums but watercoloring still remains my all time favourite. Hi friends , I love magnolia's Tilda because of her innocence and sheer cuteness. It's actually very easy to colour her in with alcohol markers but I wanted to try few techniques with more affordable and available colouring tools. 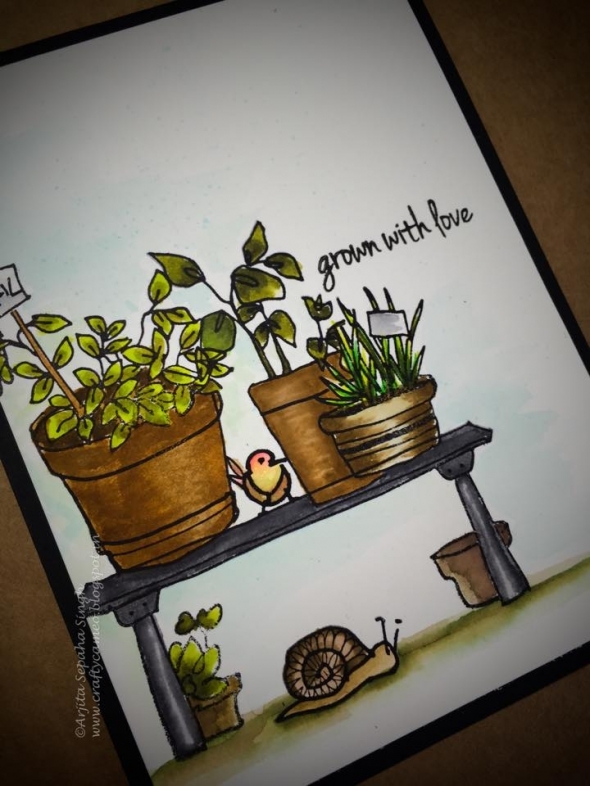 Today I decided to use the stamp set by my favourite company Altenew called Garden Grow and create a card for a friend who loves gardening. Roses are my favourite flowers and I can not stop myself from buying a stamp with flowers and specially roses. 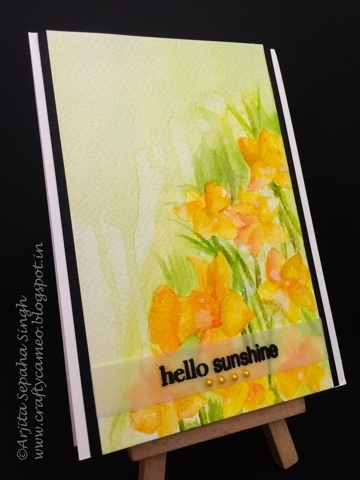 Hi guys , I am excited to share this easy and beautiful card I made using the DAFFODIL stamp set by Jane's doodle. 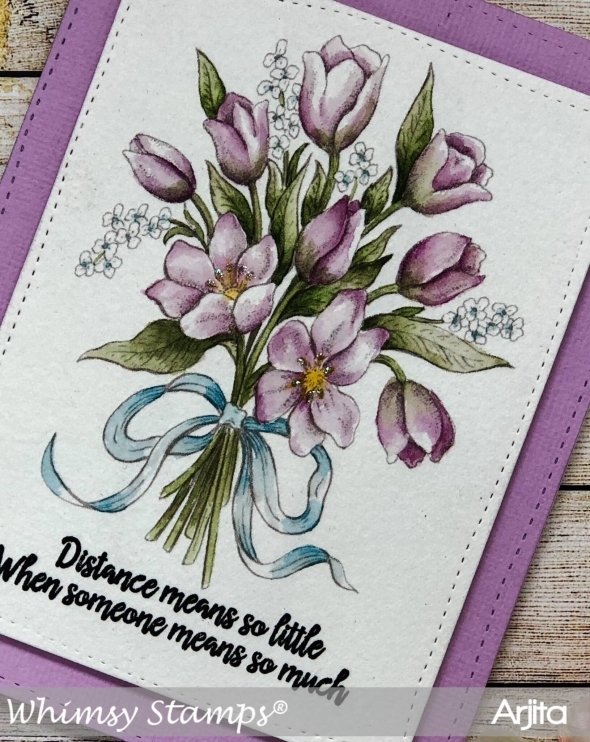 The stamp is a beautiful collection of three flowers and some amazing sentiments.